The trail contains a lot of vertical climbing which is possible without a rope thanks to ladders and steel hand rails installed along the route. Some parts are quite precarious and I’d recommend it only to strong hikers who are not afraid of heights. Anna, her sister, Ellen, and I started off at Wasserfallweg parking lot by Enns river. The path was very well marked and getting lost wasn’t a concern for the rest of the day. From the beginning the path goes through forest, and as it was approaching the waterfalls, we started to wonder where the trail was actually going to lead us. All the rock walls looked vertical and it was hard to imagine climbing them without a rope. After we reached the first waterfall, the path started to get steeper, zig zagging through the forest. The first ladder wasn’t too far away and before we realized, we were holding an old, but steady looking handrail while balacing on the middle of a long, almost vertical ladder. In these moments, don’t look down unless you are very confident with heights, and keep climbing steadily. Fortunately we started the hike in the early morning so there weren’t any people climbing down. That would have been tricky and dangerous to negotiate. After overcoming the ladder section, Ellen’s legs were a little shaky as she hadn’t done anything like that before. But, overall she was smiling and happy to keep going so after a short break we continued on a forest path towards Hesshütte. 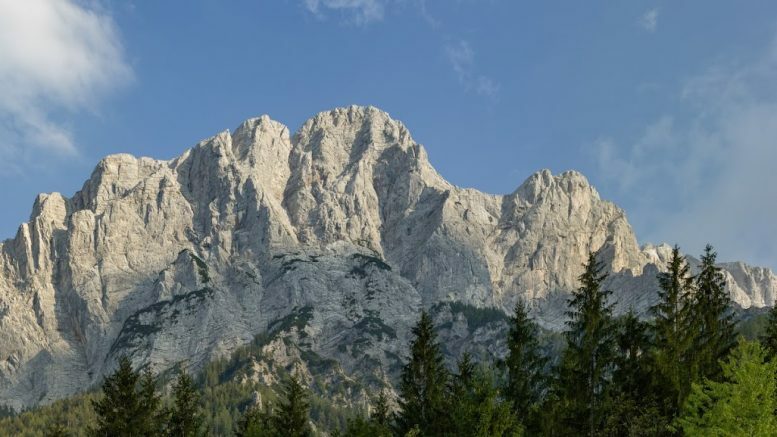 Our original plan had been to continue climbing up to the peak of Planspitze. But here we faced the need to think realistically about our capabilities and equipment. Anna had recently been sick so wasn’t in top form, this was Ellen’s first significant hike, and both girls were wearing reasonably worn out running shoes which weren’t ideal. Though it was hard to resist our egos, we decided to take the safer, easier option and traverse around instead. From the hut (Hesshütte) we took a path through a farmer’s gate towards Sulzkar valley. 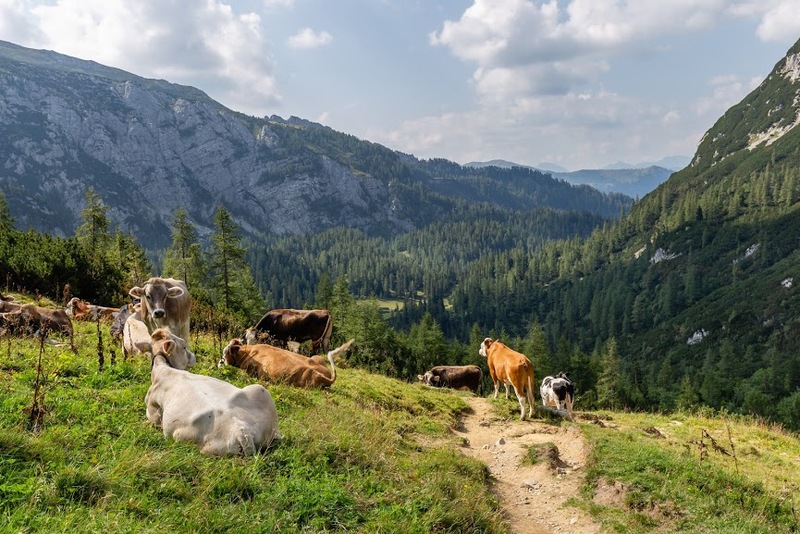 The valley is a classic Austrian Alpine valley full of cows and Alpine flora. The views were amazing and I was wondering what it would take to live in one of the mountain huts we met on the way. The rugged mountain tops loomed over us in their multitude of greys which contrasted to the smooth, lush green hillsides. 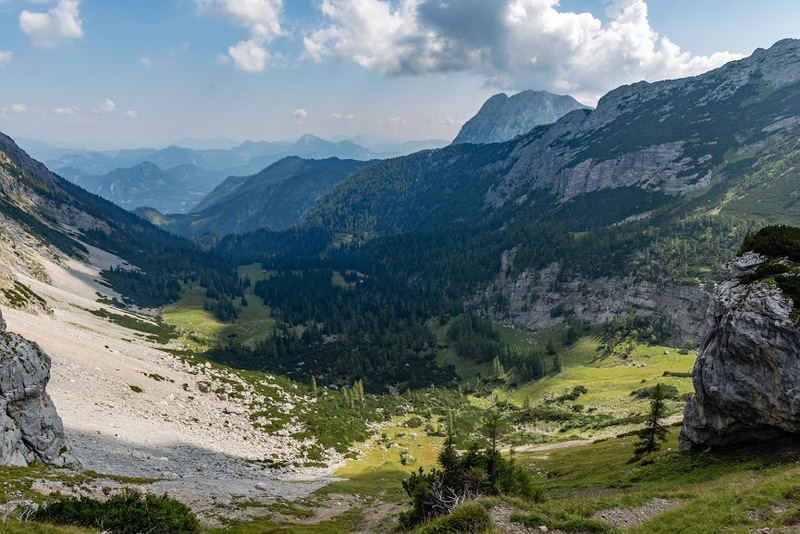 From Sulzkar we continued down to Hartelsgraben Jagdhütte and along a forest road all the way down to Enns river. It’s a beautiful, gradual deccent with some steeper sections, through lush meadows of tussock and wild flowers before reaching the forest. We passed a small cabin which may have been a kind of pub but weren’t sure. It was home to a group of very tame horses who followed us for a little while and tried to nibble our backpacks. Back to the car park required toughing it out for a few kilometers along the main road which wasn’t fun after the luxurious Austrian countryside. But, if you’re lucky (or more organized than we were on that day), you can check for trains or buses which come closer to the car park. 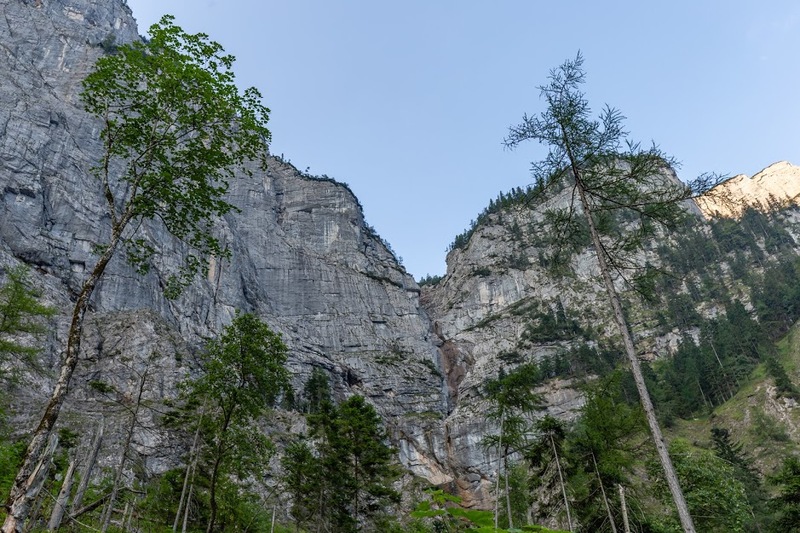 We decided to take the way back over Sulzkar Valley rather than to climb down along Wasserfallweg because we expected Wasserfallweg to be quite busy and as I said before, I’m not a fan of crossing other hikers while on ladders. It’s definitely an option though for those who want to come straight back to the car park, just make sure you have enough energy for doing something like that. Descents are often more demanding and going down the ladders with shakey, tired legs is much more dangerous than going up. Anna was nearly on her hands and knees with exhaustion at the end of this hike. So, even though her tiredness was in part justified by having been sick, it does pay to remember that attempting a sizable day hike like this should only be for pretty fit hikers. All in all, this is one extremely beautiful hike that we highly recommend. 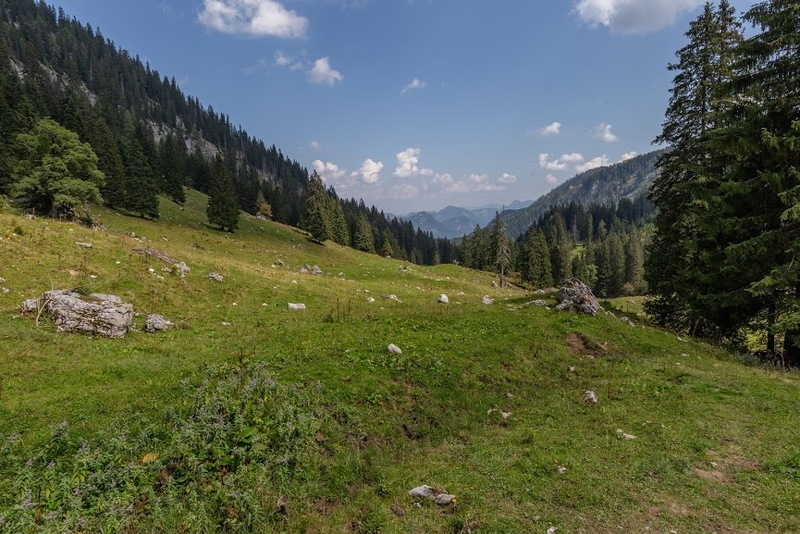 2 Comments on "Hiking via Wasserfallweg to Hesshütte and back through Sulzkar Valley in Gesäuse National Park, Austria"
Wow! I love ladders! Want to check it out one day!